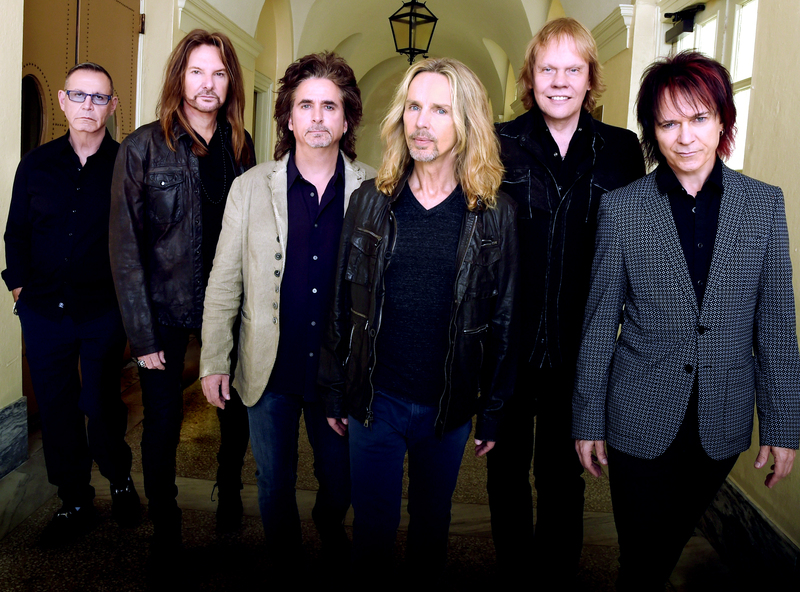 (L to R): Chuck Panozzo, Ricky Phillips, Todd Sucherman, Tommy Shaw, James ‘J.Y.’ Young and Lawrence Gowan. NASA and the rock band Styx have long shared a mutual appreciation, so it should come as no surprise that the band’s latest album, “The Mission,” is inspired by the planned 2033 Mars mission. Young explained that he believes it was the combination of the eponymous Pluto moon and the band’s long history with NASA in various capacities that gave them the inspiration for their latest album. There is no talk of returning to Earth by the closing track “Mission to Mars.” “This album is more about going to Mars and beyond. The rest I guess will be the subject of the next record,” Young laughed. There is no denying “The Mission” is a Styx album. It possesses a classic vintage quality that allows it to seamlessly disguise itself as a release from the ’70s. The iconic rock band will be in Fargo March 21, on their Laugh. Rock. Seriously! tour. The short set of shows were all originally supposed to include an opening performance from comedian Larry the Cable Guy. Unfortunately, he had to drop out of both North Dakota dates due to scheduling conflicts with current projects. Laura Ellen Brandjord (LEB): What made you decide to add ‘Mr. Roboto’ back into the mix after all these years? James ‘J.Y.’ Young (JY): Well, it was that song that broke up the band in 1983. It was one man’s dream and the rest of our nightmare, but it was a successful single. But it kind of killed our rock audience. We always had personality clashes as we go, but with this thing, because Dennis (DeYoung) promised a big success and it was — the tour was not even half as successful as any of the tours we had done in the past five years leading up to that — and the record sales were not even half what we had done. So, we stopped working together. We sort of asked our crew guys and our merchandise guy, “Well what are people asking for and what kind of feedback are you hearing about the show?” Both our merchandise guy and our lighting director said the only song they ever get requested was for “Mr. Roboto.” That has been for the past 20 years. The release of that song sort of ended the first generation of Styx success, but it really spawned the second generation, because it sold a million singles, and I think most of the people who bought it were under the age of 15. Now, they are grown up, and that song got them interested in us. Maybe they will go back and listen to our more classic music. We weren’t sure how people were going to respond, but we decided to take a chance on it. The response has been — virtually the whole crowd goes crazy for it. It was the right chess move at the right time. LEB: We’ve made it to the random questions at the end. I like to end interviews on some lighter, more conversational questions. LEB: First song you learned to play on the guitar? Please Me” (imitates guitar part). LEB: If you were stuck on a desert island with only one record for the rest of your life, what would you want it to be? times while he was alive. I would see him five thousand times. To me, he seemed like he came down from the second moon of Mars, is what I always used to say. The moons of Mars are Deimos and Phobos, so he came down from one of those and sort of landed on Earth to bring this whole new thing. LEB: What song from throughout your STYX career do you enjoy playing the most? JY: Probably “Renegade.” I mean “Come Sail Away” is right up there too. Those two are arguably our most popular songs. “Renegade” because Tommy (Shaw) wrote the lyrics and the music basically, but through just a twist of fate, he had to go away when we started working on recording it. He’s (Tommy) got one little sort of acoustic scratch guitar track that he played when we laid down the bass and the drums to get the structure of the song. I just overlaid with stuff to see what I could do with it. Then “Come Sail Away” because it started as a song about a sailing ship, but because of me I suggested that, that sailing ship turned into a starship. Dennis (DeYoung) ultimately embraced that idea lyrically. It really became the soundtrack of outer space music. So, I feel connected to that genesis, but also it’s a great song that has a great arc and a great finale. LEB: Speaking of Star Wars, Star Wars or Star Trek? JY: I’d probably vote for “Alien,” but I mean I was the guy who watched Star Trek, and I was the guy who certainly went to the Star Wars movies, no doubt about it. I’m also a Star Trek fan. I’m the Mr. Spock of STYX. I’d be a science officer because I have a bachelor’s (degree) in mechanical and aerospace engineering. LEB: At least you’re not a red shirt. They never seem to fare well in conflicts. (Both laugh) You are a fan, too, aren’t you?